Unlike other frozen margaritas, there is no ice in this recipe. This Frozen Mango Margarita is just frozen mango, tequila, lime juice and agave syrup. 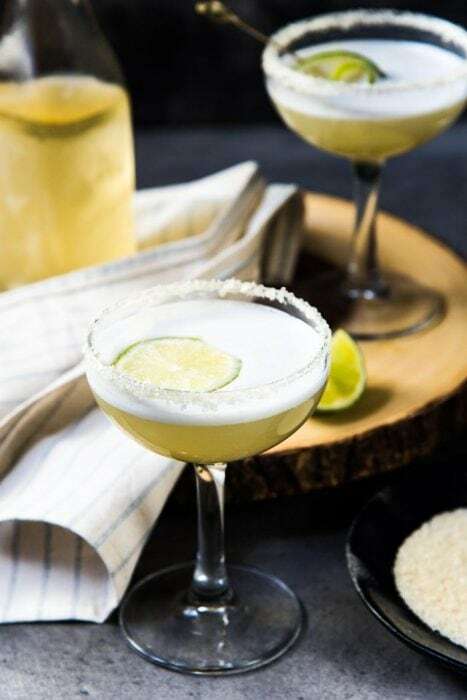 It’s a creamy, sorbet-like, fruity and refreshing frozen margarita with a spicy lime chili salt ring to kick it up another notch! I’m a sucker for mango sorbet. Hell, I’m a sucker for mangoes. And when summer rolls around, and juicy, ripe mangoes are in season, I’m all over them, any way I can get them. Eating fresh, sweet mangoes out of hand is of course my favorite, with mango sorbet a close second. This frozen mango margarita recipe is different (and better!) from other frozen margaritas because it contains absolutely no ice! It’s just pure, unadulterated mango and margarita. So you end up with a margarita slushie that’s almost like a sorbet – creamy and fruity! Then on top of that you have the deliciously spicy Tajin seasoning that adds a lovely citrus spice, which perfectly complements the cool, refreshing mango sorbet. 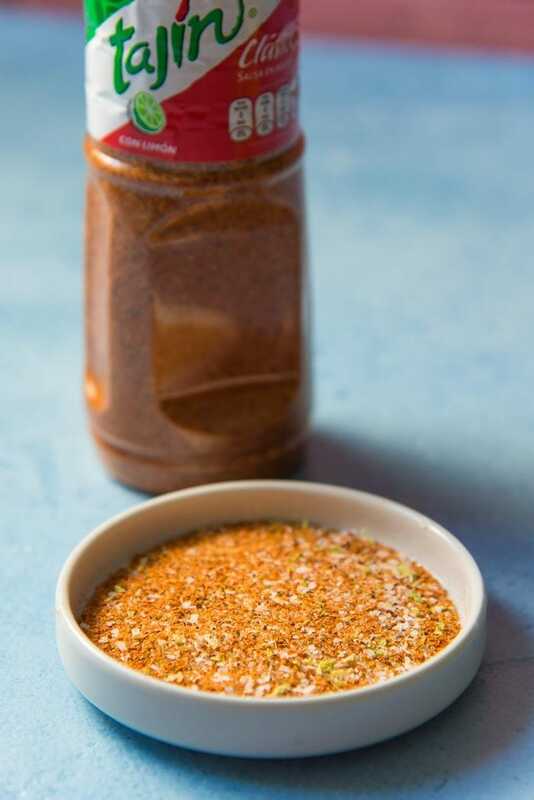 If you can’t find Tajin seasoning, don’t worry, there are other spicy alternative that you can use, OR you can make your own lime chili seasoning too. OR you can leave out the spicy seasoning for a regular frozen mango margarita, which wouldn’t be as adventurous, but still amazing! You can make this spicy frozen mango margarita recipe in several different ways. 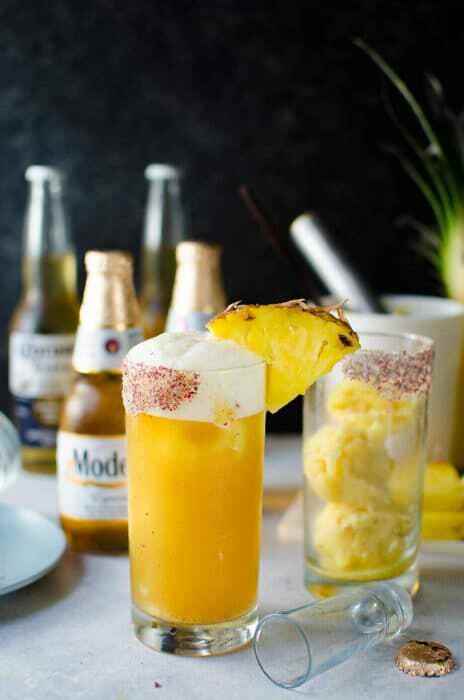 To make frozen mango margarita with frozen mango – this is my favorite way to make this cocktail. 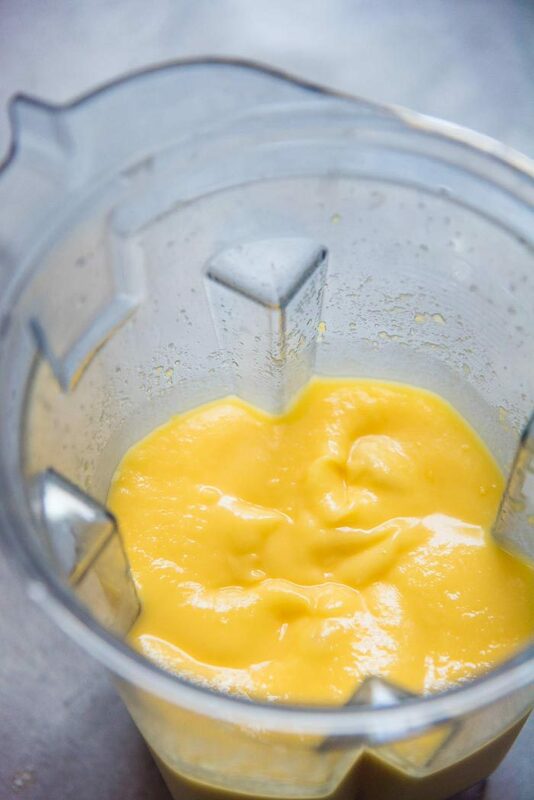 It’s ready to be enjoyed as soon as you blend all the ingredients. 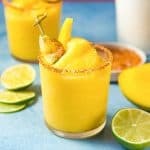 You can buy already frozen mango from the supermarket and use this to make this mango margarita in your blender. This is the quickest and easiest way. To make frozen mango margarita with fresh mangoes – peel and cut fresh mangoes first, and then place them on a tray and freeze. Once frozen, they can be used as indicated in the recipe. To make frozen mango margarita with mango nectar – I know from experience that in some countries, it’d be hard to locate frozen mangoes, and canned mango nectar is much easier to find (most likely in local Asian/Indian grocery stores). Pour the mango nectar into silicone ice cube trays and freeze. Once frozen, you can use the mango ice cubes to make the frozen mango margarita. Another way to make frozen mango margarita with mango nectar – you can blend all the margarita ingredients and the mango nectar (or fresh mango) to make a regular mango margarita. Then place the blended contents in a shallow dish, and whisk the contents every few hours to make a slushie! This frozen spicy mango margarita can be stored in the freezer for a few days as well! So it’s perfect to be made ahead for parties and gatherings. This cocktail tastes delicious and refreshing with or without the spicy salt ring, so it’s entirely up to you. 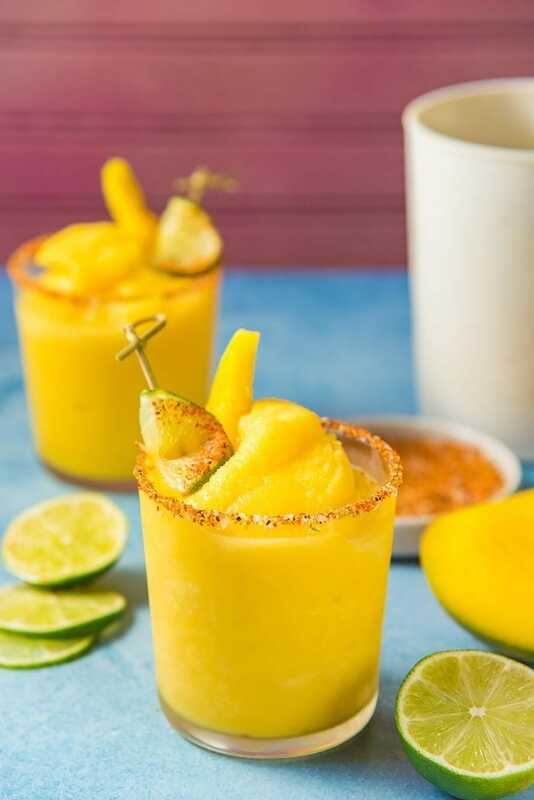 If you liked this frozen mango margarita with Tajin recipe, don’t forget to subscribe for new (and free) recipes by entering your email address on the side bar (and get all these recipes delivered straight to your inbox), so you don’t miss out on a thing. You can find me on FACEBOOK, TWITTER,INSTAGRAM, PINTEREST, YOU TUBE and GOOGLE-PLUS too. 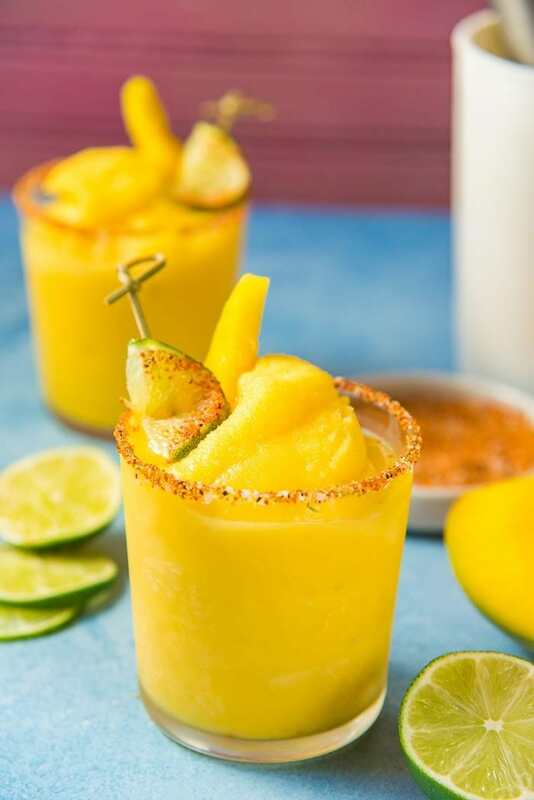 Frozen Mango Margarita - a creamy, sorbet like, fruity and refreshing frozen margarita with a spicy lime chili salt ring to kick it up another notch! You can switch between US and Metric measurement by toggling between the buttons below the ingredients. 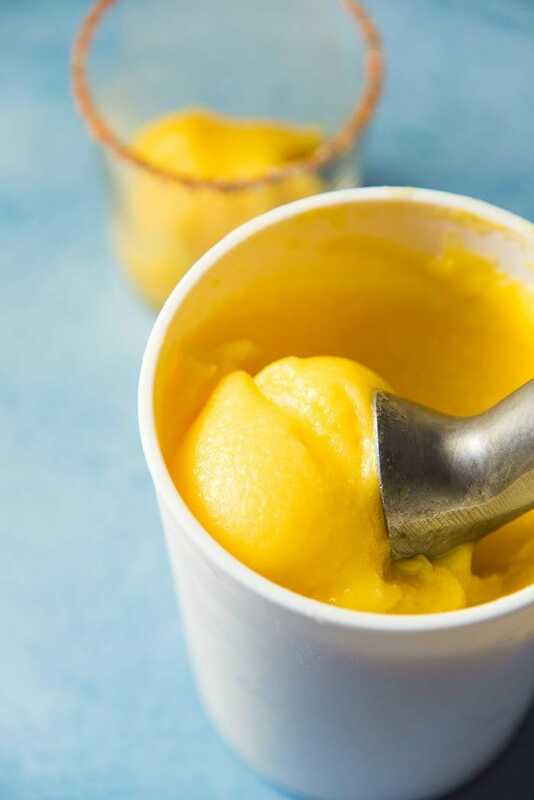 Use the frozen mango margarita immediately, OR transfer it to an ice cream container and store in the freezer until needed. 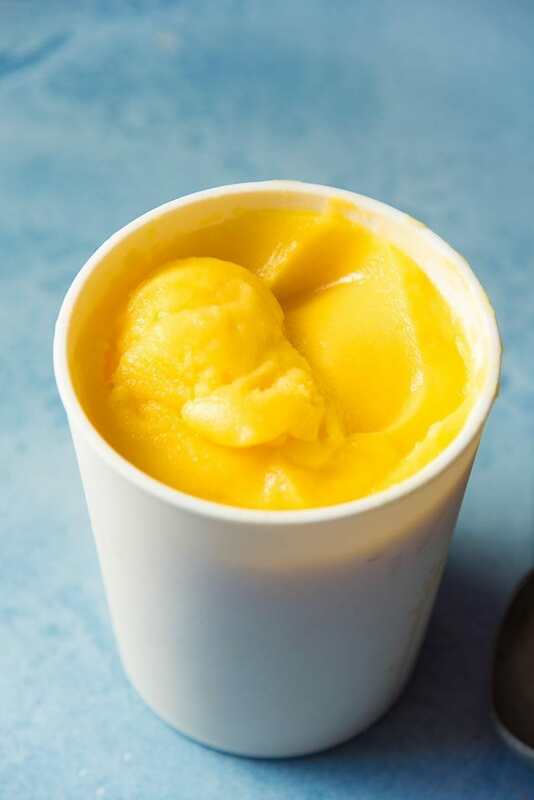 Please note that the frozen margarita will not freeze completely in the freezer, and will always have a soft sorbet-like texture. Rub a lime wedge on the rim of your serving glasses. 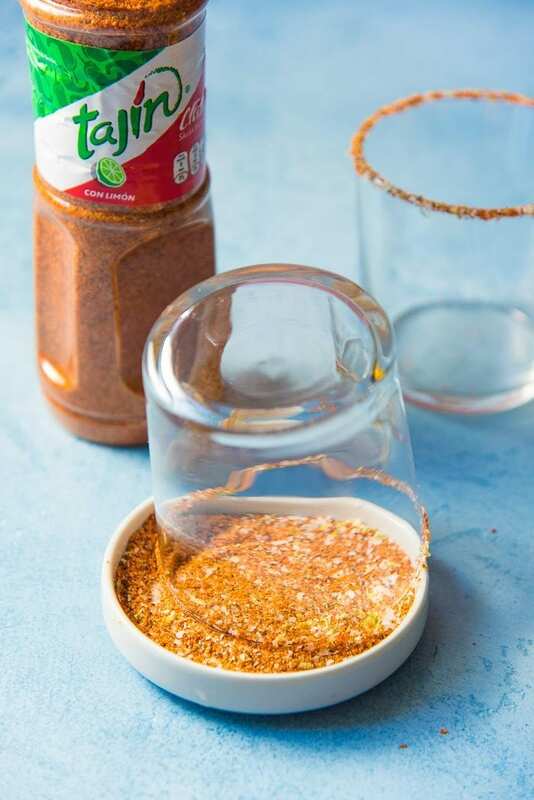 Dip the glass rim in the Tajin seasoning and set aside. Thread the lime slices on cocktail picks and half dip the lime slice in tajin seasoning. 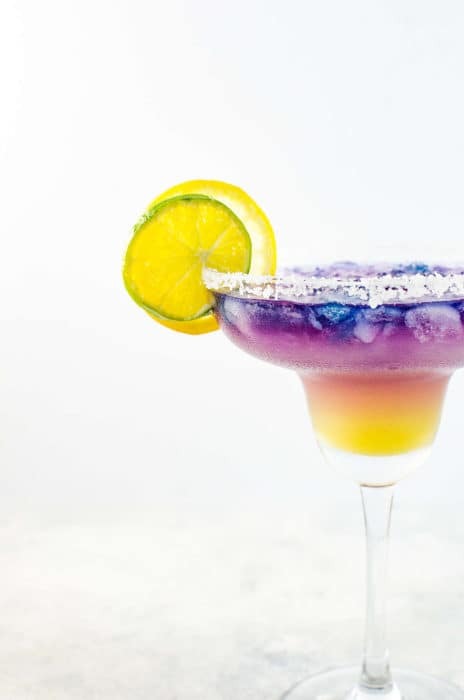 Fill the rimmed glasses with frozen mango margarita and garnish with lime slices and fresh mangoes. Serve immediately with a thick straw. 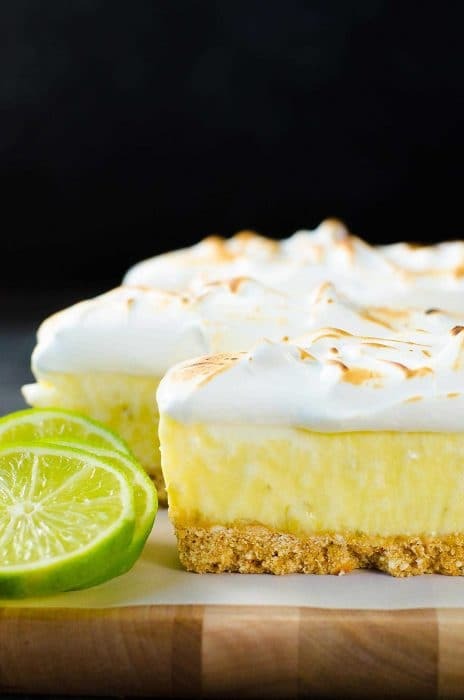 Recipe conversion - you can add extra mango to this recipe if you like. The 1 lb / 455 g of mango is only a guideline. And instead of US cups, you can use UK/Aus cups as well. LOVE TEQUILA? Check out these Tequila Cocktails! I used the frozen mango chunks. We do not care as much for heavy alcohol in our mixed drinks so I used the same ratio of lime juice, triple sec, and tequila. In my opinion, the Tajin is NOT optional. That is just fabulous with the mango.